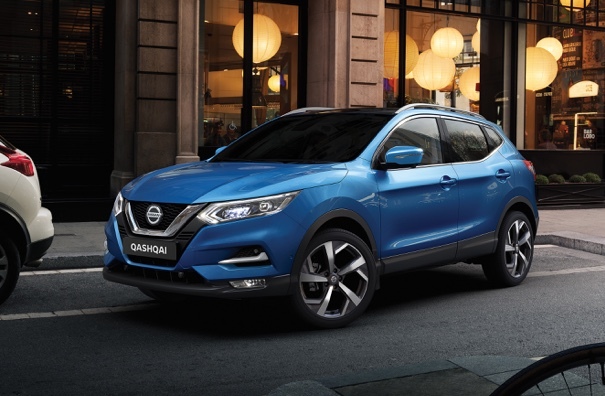 NEW NISSAN QASHQAI. Intelligence is the answer. Technology that gives you the edge. 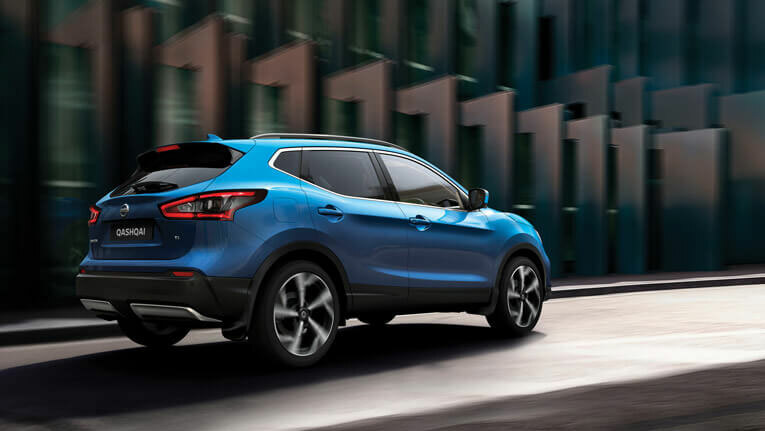 The new Nissan QASHQAI combines stunning, sophisticated looks with efficient aerodynamics. 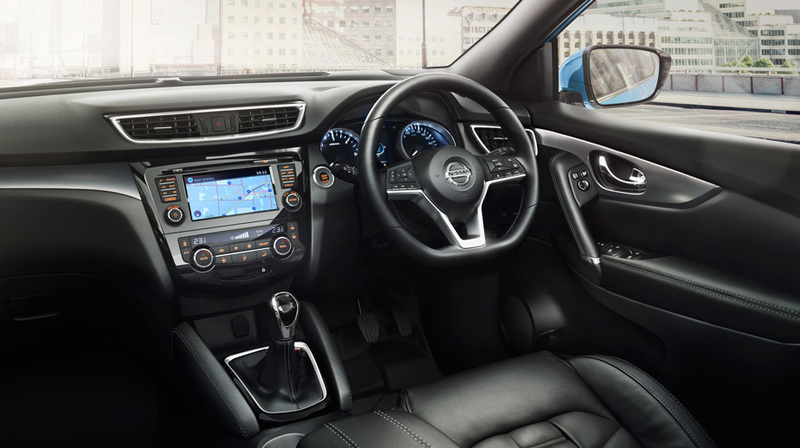 Step inside the Nissan QASHQAI and you'll soon discover a suite of intelligent technologies that make you more confident behind the wheel. 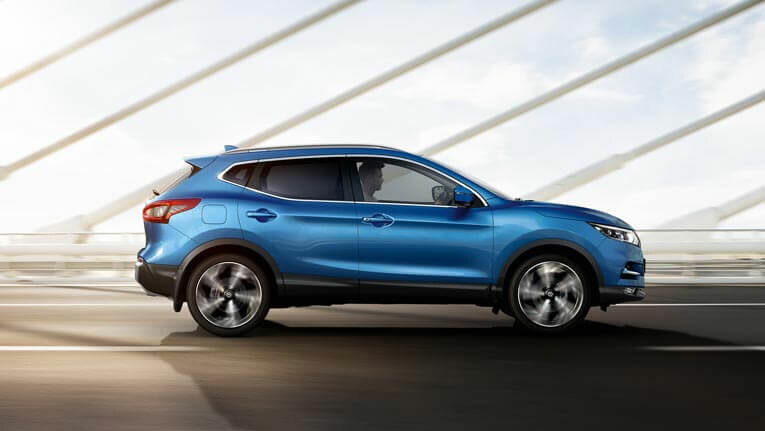 Enjoy the stares from the street in the clever Nissan QASHQAI. 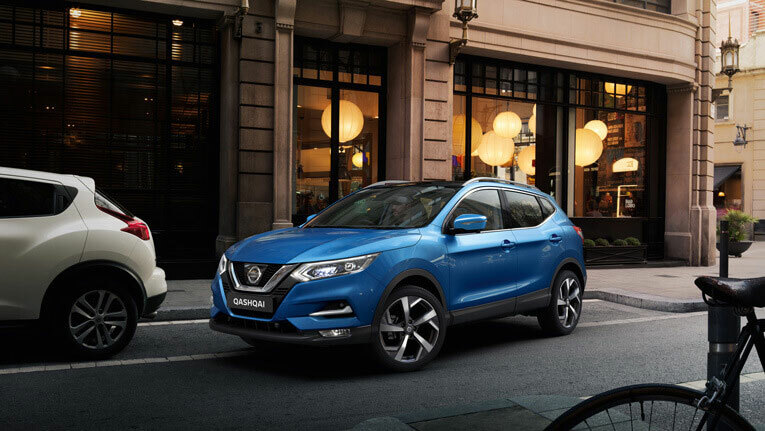 Featuring a stunning range of stylish improvements that include a sleek headlamp design, redesigned alloy wheels and with a new front grille and bumper design, it’s our most dynamic and sophisticated compact SUV yet. 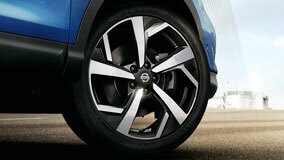 Three new designs of alloy wheels are available - including these 19 inch diamond-cut alloy wheels^. 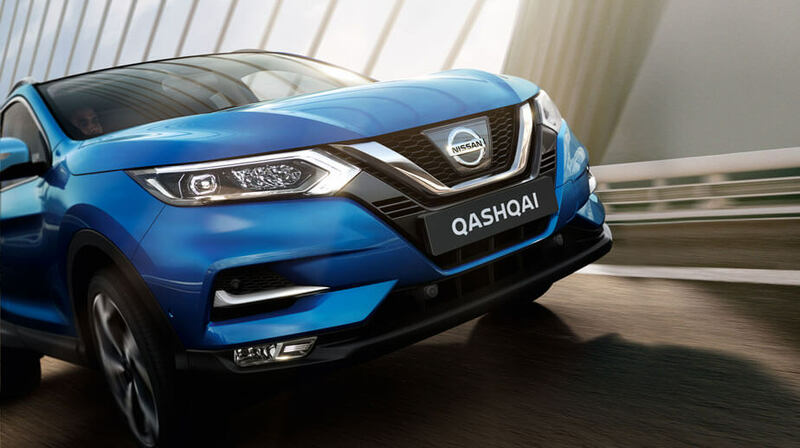 The new headlight design includes LED Daytime Running Lights across the range. 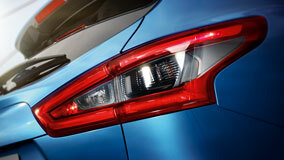 Make a statement with the rear ‘boomerang’ LED lights featuring a new 3D lens effect. 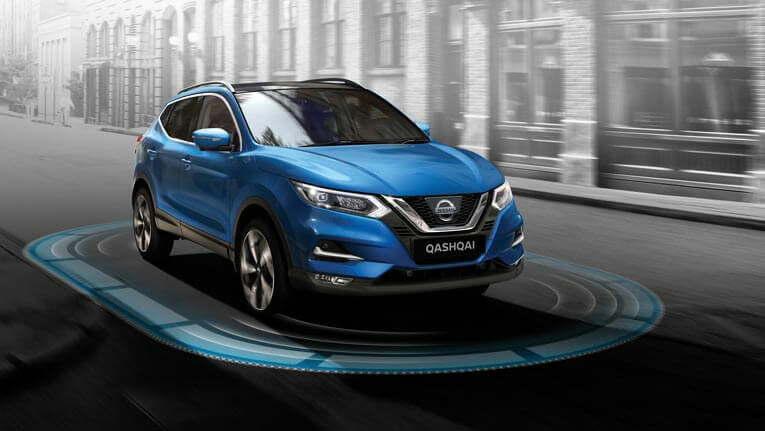 Take control with confidence behind the sporty, new steering wheel while the Nissan QASHQAI’s panoramic glass roof^ lets the light flood in. 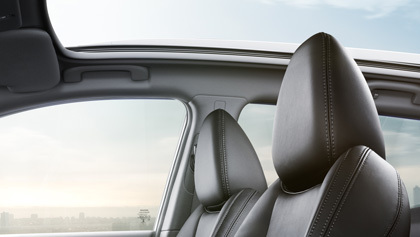 Premium seats for ultimate comfort. 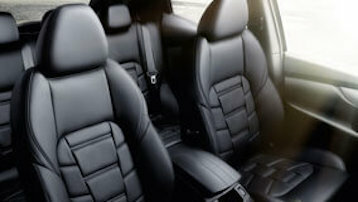 High quality Nappa leather-accented seats^ and soft 3D quilting finish surround you in lasting, luxurious comfort. Experience more of the world outside through QASHQAI's panoramic glass roof^ with electric one touch shade. 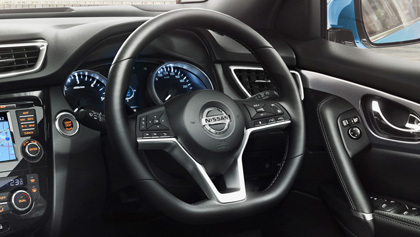 Take control with confidence behind the sporty, new steering wheel. 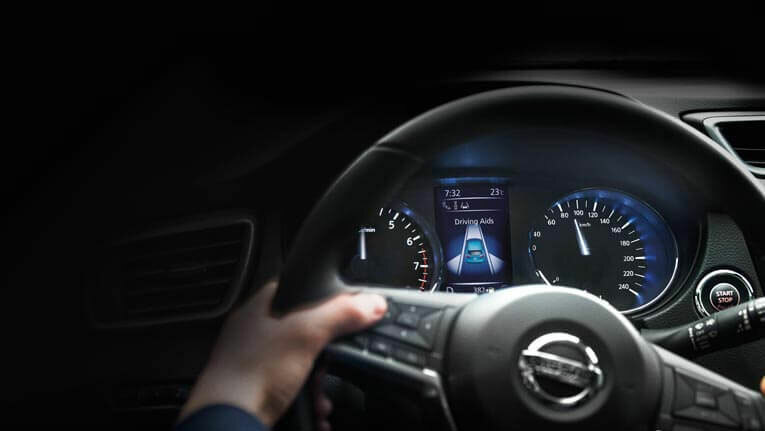 Nissan Intelligent Mobility redefines the way we power, drive and integrate cars in our lives. 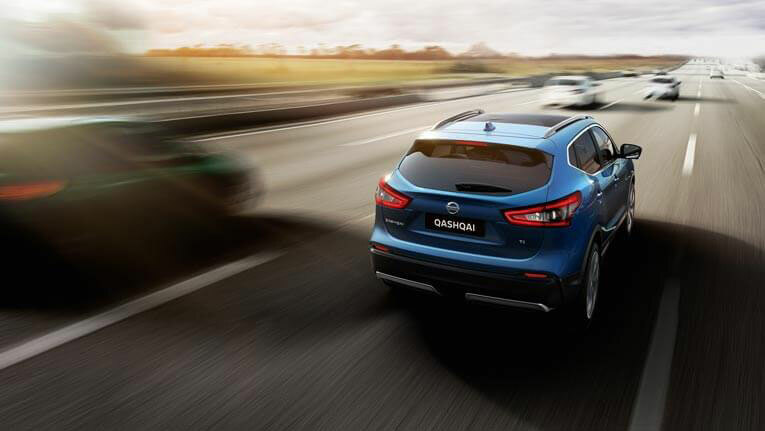 Step inside the Nissan QASHQAI and you’ll soon discover a suite of intelligent technologies that make you more confident behind the wheel. 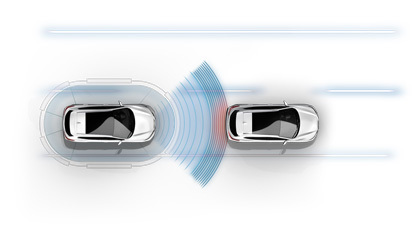 Using radar technology to keep an eye on your proximity to the vehicle ahead of you, Forward-Collision Warning can give you audible and visual display warnings to help you know when to reduce your speed. 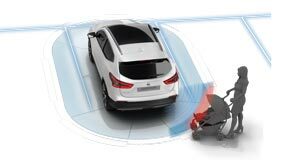 If required, the Intelligent Emergency Braking will apply braking to reduce vehicle speed to avoid or reduce the severity of a collision. 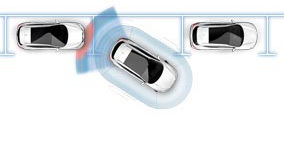 If another vehicle is detected in the blind spot area, an indicator appears in the driver’s or front passenger’s door pillar. Then, if you put your turn signal on, the indicator flashes with a warning chime. 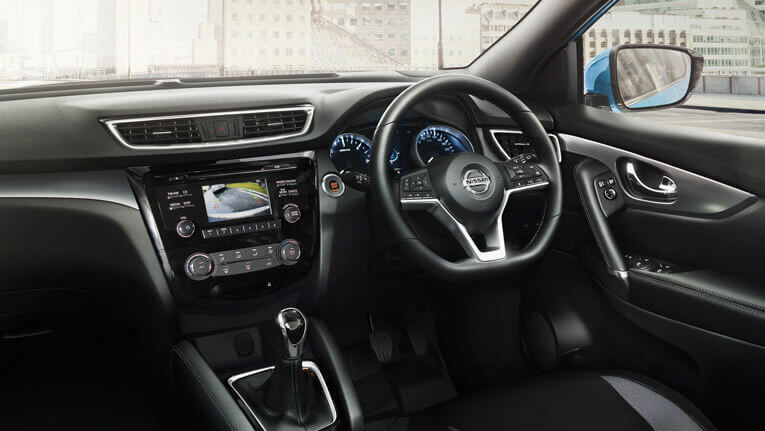 Nissan Future Value is a finance solution that lets you keep your options open at the end of your loan term. 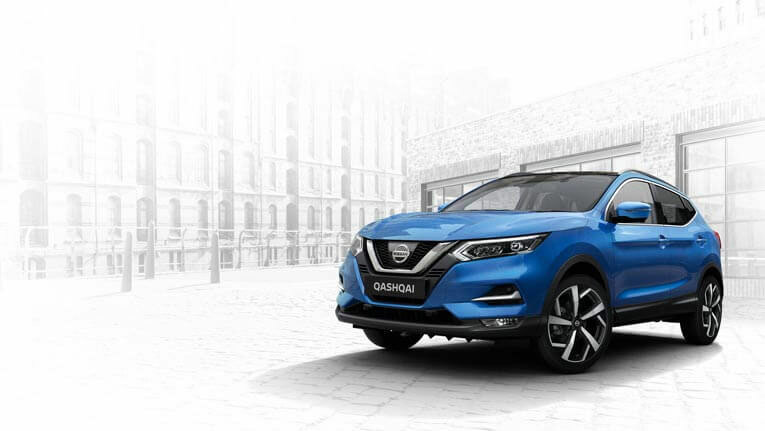 With Nissan Future Value, you can take comfort in knowing up front how much your QASHQAI will be worth to Nissan at the end of your loan term*. Which means whether you upgrade, retain or return your vehicle, you can rest assured that your future is sorted. 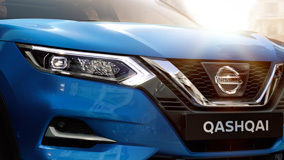 * Under the Nissan Future Value (NFV) program, you can sell the vehicle back to Nissan Financial Services (Australian Credit Licence Number 391464) for the pre-agreed future value (adjusted for excess kilometres and the cost of repairs for vehicle damage beyond fair wear and tear), to pay the final balloon payment on your loan. 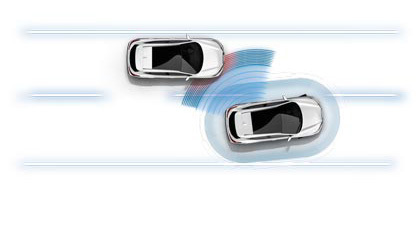 Allowed kilometres and vehicle condition requirements are set out in the NFV agreement. Terms and conditions apply. 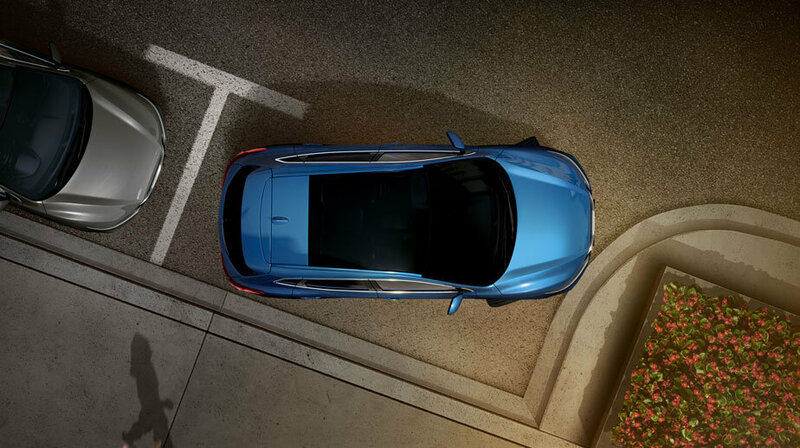 The Intelligent Around-View® Monitor* uses four cameras to give you a virtual composite 360° birds eye view of your vehicle, with selectable split-screen close ups of the front, rear, and kerbside views, so you can get a better look. *ST-L and N-TEC models only. 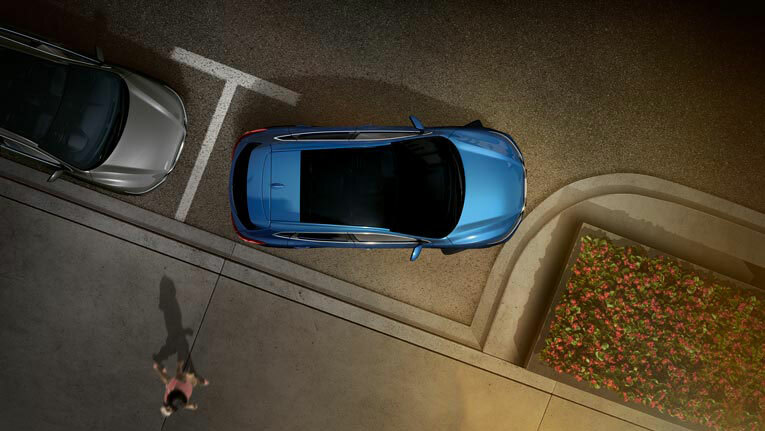 Moving Object Detection* can detect moving objects near the vehicle, and can give you a visual and audible alert. *Ti & ST-L models only. 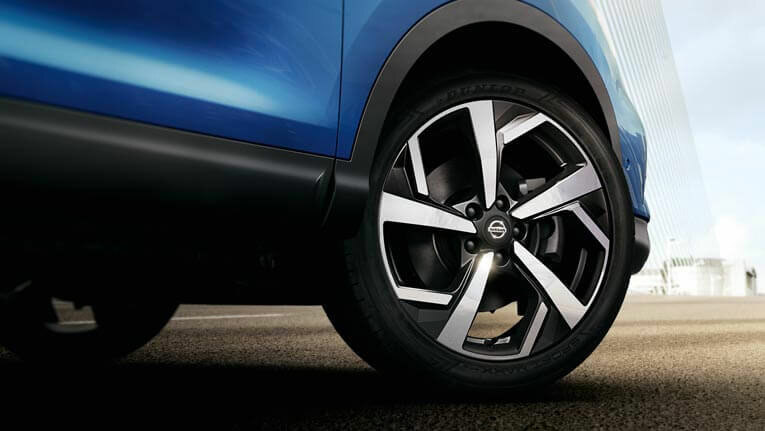 Let the Nissan QASHQAI take over parking duties, Intelligent Park Assist^ helps you steer into those tight spots. Rear Cross-Traffic Alert^ warns you of approaching traffic when you reverse. 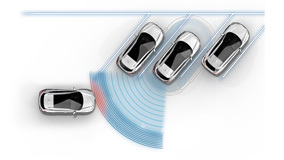 #Moving Object Detection, Intelligent Park Assist, Rear Cross-Traffic Alert, Intelligent Emergency Braking with Forward Collision Warning and Blind Spot Warning are driver’s aids only and should not be used as a substitute for safe driving practices. 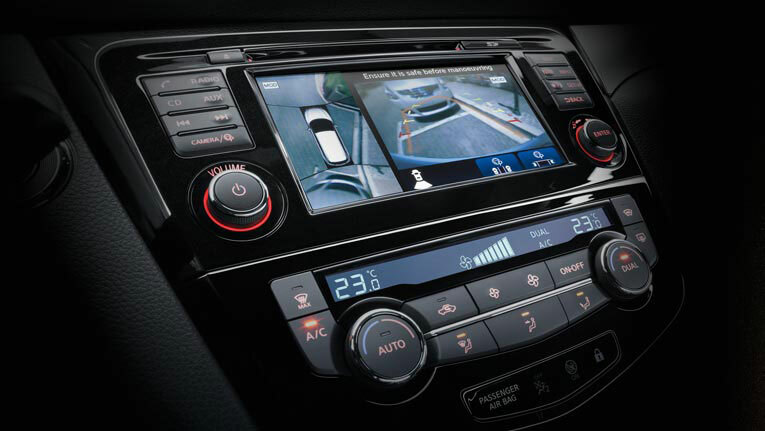 Always monitor your surroundings when driving. 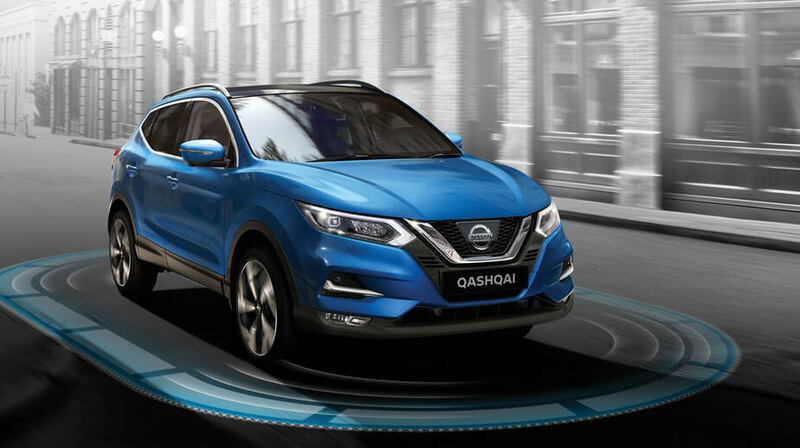 Choose your QASHQAI to suit your needs.